Easing the workload for architects and contractors across the country with our latest innovation. Media surrounding the construction industry is constantly buzzing with information and news on Building Information Modelling or BIM, as most of us know it. We are all familiar with how important it is and understand at this point that it is the future of how buildings are going to be planned, designed, built, and managed. The changes Steve was referring to are not actually specific to KCC, but relevant to the entire construction industry. One such requirement was CE Marking. In 2011, CE Marking became mandatory for construction products covered by harmonised European Standards (hENs). It became a necessity for manufacturers like ourselves to make a Declaration of Performance (DoP) for the product and where appropriate affix the CE Mark.. The second factor that had a huge impact on the construction industry, was the introduction of Irish Amended Building Regulations 2014 (BC(A)R). With a stringent inspection and certification process, the possibility of ‘passing the buck’ or slacking on quality adherence or best practice simply wasn’t possible. This presented the need for comprehensive product performance statements and test evidence to allow buildings to be certified and occupied. BIM, quite obviously, became another major factor. The UK Government mandate that came into effect in 2016, insists that all public government projects must be BIM Level 2 compliant by the end of 2016. The growing need to have products available as 3D objects, complete with performance data to use in a 3D Model, became a necessity for us to respond to our clients needs. 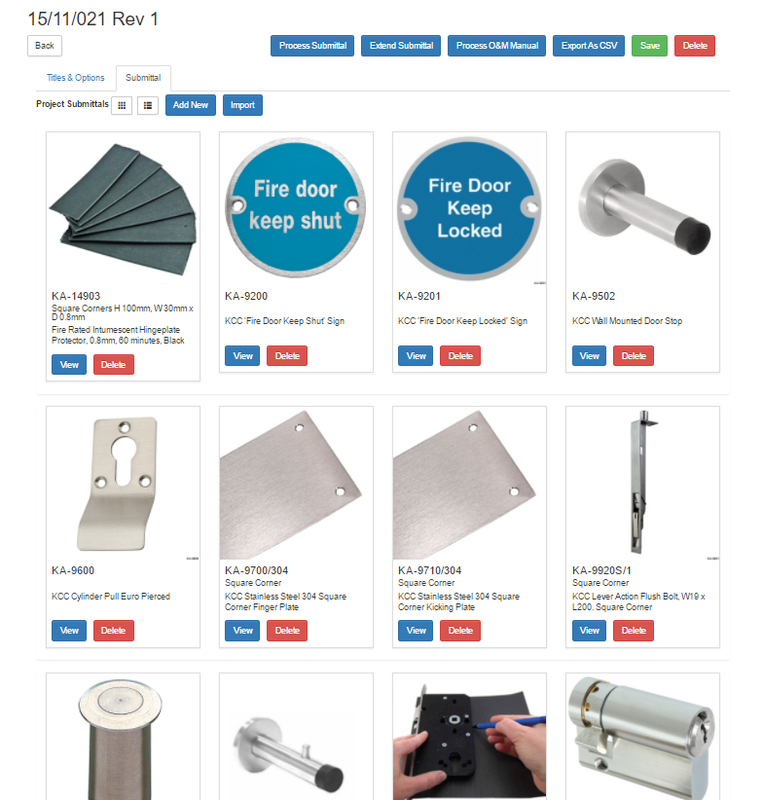 We built Datastore in response to our clients needs and a notable gap in the marketplace. 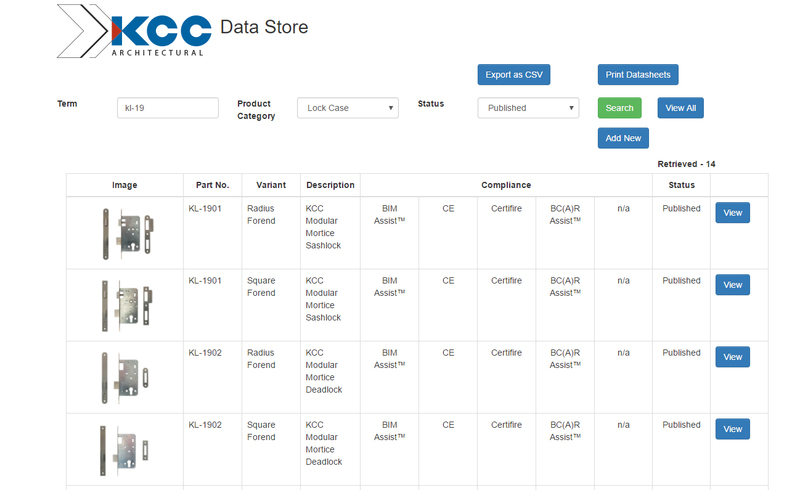 To put it mildly, Datastore is an architect or building contractors dream! An enormous piece of work, in the guise of a vast database of every single component KCC provide, the information is publishable as concise yet comprehensive individual datasheets at the click of a button. We weren’t happy to stop there however – The Datastore system also delivers project specific catalogues (aka ‘Technical Submittals’) detailing every item we are providing to a particular project, and include images, performance characteristics, dimensions, options, finishes, test evidence, and warranty information. Steve was heavily involved in the development of Datastore and says “These technical submittals link directly to our scheduling systems to allow us create project specific catalogues within minutes and it allows us the flexibility to make revisions quickly where necessary. We weren’t content to stop there however, and we went on to develop the system further to be able to produce submittals with 100% of our back up evidence – every test certificate, every fire test report. We can provide the submittal in hard or soft copy or for those that are working within BIM models, we can export the data in a variety of formats”. This is just the start of our plans as we are now building a library of 3D Revit Models. These and other major enhancements will be released later in the year —- Watch this space! !